Should Applications Listen to the Network? I think of the past 30 years of networking as plain old networking (PON). I am referring to networking post the open sourcing of SNA and that also dates myself 😦 The seminal achievement of SNA in the late 1970s to mid 1980s was to make minicomputers viable from an enterprise perspective. Enterprise computer networks were completely dependent on the mainframe computers supplied from IBM or one of the minor mainframe suppliers. SNA was a proprietary solution implemented by IBM, but it was an open source solution. This enabled the suppliers of mini computers such as DEC, Wang, Prime, Data General, Apollo, and others to use SNA technology to deploy their systems into the network. Open source meant that competitors as well as providers of non-competitive systems had access to the technical implementation of SNA and thus could use SNA to add their computers to an SNA network. The mini-computer vendors implemented a PU_Type 2 node capability on their computers, which enabled these machines to seamlessly interact with mainframe computers as well as each other. This was the genesis of distributed computing. It was a seminal moment that gave birth to the commercial network within the enterprise market and started the progression towards the client/server network. Today, we are tearing away the last vestiges of the client/server networks and building clustered app server networks in data centers. We are now in the server to server era. I have written about the server to server era in the past many times, but here is the most recent post. There have been a number of network transitions over the past 30 years, shared media (hubs) to switches, emergence of TCP/IP, WDM, etc., but in a basic form we have been building the same network construct based on reachability, interoperability, distributed state and yes overlays. Overlays have been around a long time. Networking is also hard and it is not the same as storage and compute. 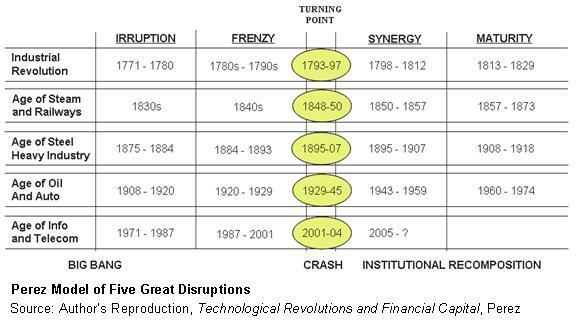 In the past, I have used Carlota Perez’s model of technology disruptions to frame the market change process. This is a link to her book if you would like to read it. I have met her, heard her speak and I endorse her book. I think networking and IT in a general manner is entering a turning point after the frenzy of the last ~20 years. This will lead to long period of time in which we build new networks, new IT systems and if you read Carlota’s book and then look at the IT landscape today, there are many supporting arguments that we are indeed in a turning point leading into a new IT era. This is the crux of the drama in networking. What will the new era look like, who will be the winners and when will it start? I think we are now at the point that Carlota calls the “Turning Point.” What everyone wants to know, is guessing at and is playing for is where will the turning point land and who will be the winners? During the next 18-36 months we are going to hear a lot about building the network differently. All vendors are in the PON camp today and there is nothing wrong with being in the PON camp; it is where 99.999% of the TAM exists. The question is are we at a turning point and will this lead to an new era using the Perez model as a reference? Will networks be built differently and will this lead to new software service silos versus hardware service silos? That last point was for the NFV crowd. How much of the PON TAM moves to new application centric networks built with a rich set of diverse multi-pathing tuned to application workloads? I clearly stated in my last blog post that Plexxi is a company built around the notion that we are going to build networks differently. It seems to me after reading the messages from Cisco at CLUS 2013 and their recent messaging during VMWorld week (see links above) that Cisco is sounding a lot like Plexxi. This is a bit concerning because Cisco is the undisputed king of PON and I would simply prefer that they remain focused on plain old networking and leave the next era for the rest of us. Funny comment on TSwizzle…yes, JT is Justin Timberlake — not James Taylor.